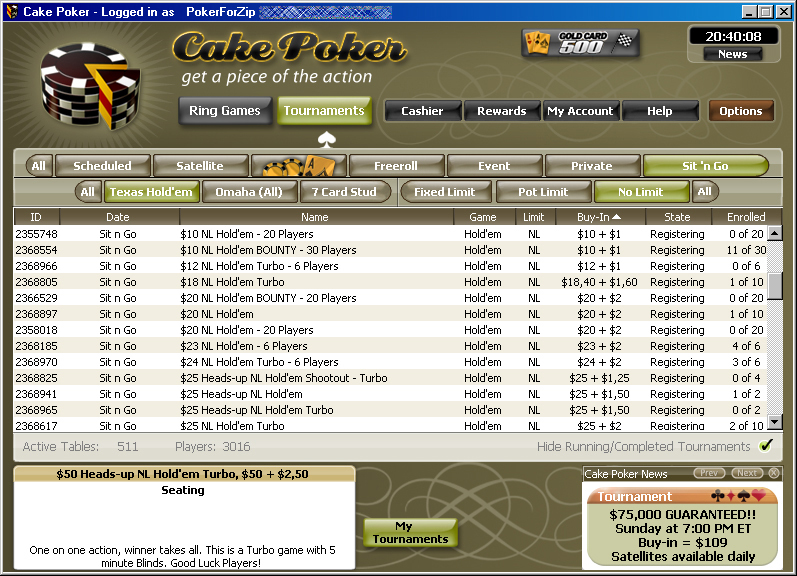 CakePoker, a name we never really liked that much and we stayed away from promoting it so far just because of that. Things may change though, so we finally took a peak at it if they were really all that what others were saying... and we agree, CakePoker is rock solid! Their software is excellent, it has everything there is to offer. Unfortunately we've also seen some serious issues with the network, so that's a big minus, especially for players who play more tables at once. Though, you will be refunded when you suffer a connection loss, it just takes an e-mail to support with the tournament ID and they look into it. Also, this was not a consequent problem during our testing session that lasted a couple of days. Perhaps we've been unlucky to play at a bad moment. Speaking about support, we firstly thought they lack a little of contact methods. Still, since they respond (and act) within 2 hours, we were extremely satisfied. According to us, CakePoker has a support department that we like to categorize amongst the best and friendliest out there. Very noticeable, CakePoker is a US friendly poker room, as the majority of players seem to be from the United States. In the following part of our CakePoker review you can read in-depth information about CakePoker's client, website, security & integrity, traffic & games, bonuses & promotions and support. The CakePoker software is nice, simple and quite unique as it's initially been developed for CakePoker only. CakePoker offers all the standard industry features, like player notes, four color decks, graphical hand history, resizable tables, etc. You name it, they've got, it including the "fold to a bet button", which comes in very handy when playing multi tables. To select a game, you can simply use the CakePoker tournament filter, which contains two tabs, one for Scheduled Tournaments and one for Sit 'n Gos. Besides, the poker room lobby is very easy to understand and by using the lobby filter you can adjust it to get just those games you are looking for. The tables are partly customizable, you can switch to classic mode which basically turns off the avatars (recommended if you like to disable all distractions). Tables are resizable to any size. The recently increased first deposit bonus for CakePoker could be the reason why choose to play there. They now offer 110% (instead of 100%) up to $500 plus and entry to their new depositors freeroll. First of all, CakePoker has several promotions attached to their Gold Cards/Gold Chips reward program. You can read comprehensive information about all CakePoker bonus offerings, including a Cake Poker sign up code, and promotions on CakePoker.com. But that's not all, take CakePoker's Freeroll into Millions satellite series for instance, where you will have the opportunity to win a share of $1,000,000. Or what about their satellite and qualifier offerings? 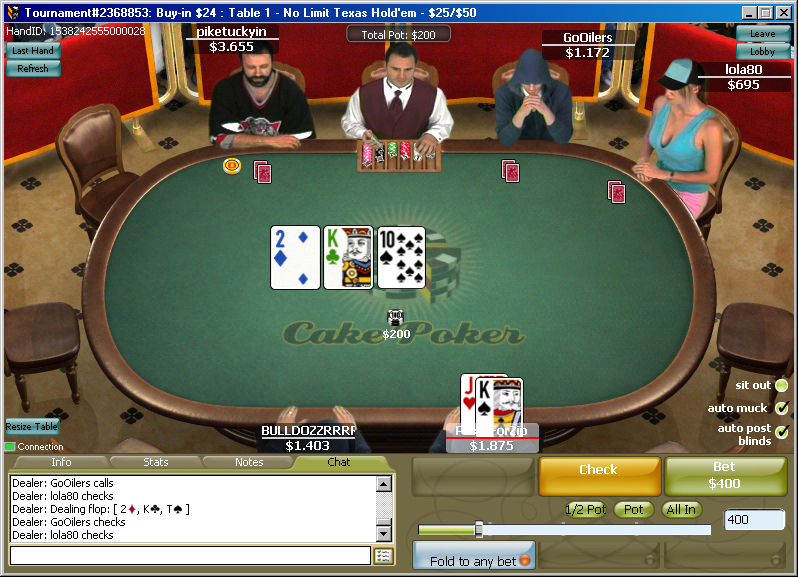 CakePoker is one of those sites where you can play yourself all the way to the World Series of Poker Main Event. The CakePoker security staff have made integrity and security of games a top priority, meaning that they've adopted numerous (undisclosed) preventative methods to help identifying and eliminating individuals attempting to cheat or groups attempting to collude. Additionally, players' hands (including history of hands and actions) will be screened thoroughly when reported. Their servers are secured against hackers with a SSLv3/TLSv1 encryption, which is an internationally accepted standard. Basically this means that all data transmitted between your computer and their servers is protected with similar protection as an online bank would have. For one of the smaller independent networks, they are doing really well traffic wise. They usually have between 2000 and 5000 players online, thus plenty of traffic to give you enough games to choose from. As usually, traffic concentrates at the Texas Hold'em games, but some traffic can be found at the Omaha and 7-Card Stud tables as well. All games come in all the well know types, limit, pot limit and no limit, as well in all kind of stakes and buy-ins. Sit 'n Go's seem to fill up real quick, you can choose from full table, shorthanded and heads-up, but also from shootouts and bounty SNG's. We strongly recommend CakePoker for their large amounts of guaranteed poker tournaments, since the level of game play is quite low in general and lots of money is for the grabs for the better than average poker player. We already mentioned that CakePoker offers outstanding support. Unfortunately you can only reach them by e-mail, but the response time makes up for that. Besides, they have written everything there is to know in their FAQ section online. To give you some more details, when we contacted support because we got disconnected (don't get us wrong, over the weeks we have been testing the CakePoker software, we only suffered from a bad connection a just couple of hours during one day and this has been all the way back in the summer of 2008) we were helped with outstanding service. We told them we got thrown out of the system and that weren't able to log in for quite some time. They responded mannerly, refunding all our buy-ins.